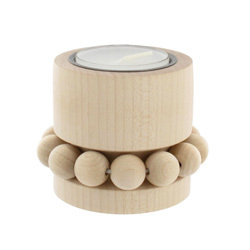 Made from sustainable wood, this chic tealight candle holder will add a natural warm glow to your home. The natural wood tealight holder is the perfect home accessory for your dining room, living room or conservatory. Display the wooden tealight candle holder on your dining room table, coffee table, window sill or mantelpiece for a cosy warm feel.